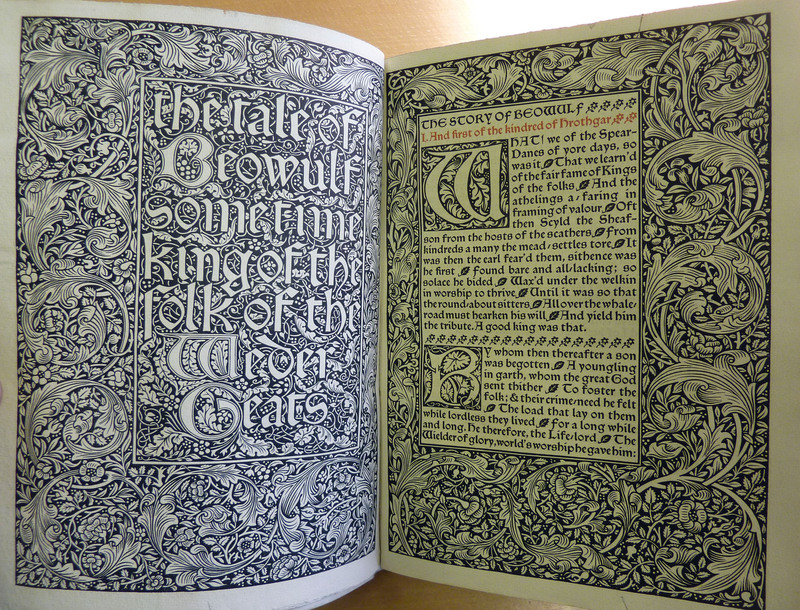 Woodcut title of "The tale of Beowulf" with gothic lettering designed by William Morris. Published in 1895 by the Kelmscott Press as a limited edition of 300 copies. We have just started the enviable task of cataloguing SCOLAR’s extensive set of beautifully printed and finely bound private press books. The Cardiff Rare Books Collection contains several thousand of these works, produced by fine presses such as the Kelmscott Press, Essex House Press, Golden Cockerel, Ashendene and Doves Press. Many smaller British presses are also represented in the collection, as is the work of private presses in Europe and the United States, with examples from the Bremer Presse in Munich and the New York’s Harbor Press. The private press movement flourished at the turn of the 19th and 20th centuries, beginning in 1890 with the founding of the Kelmscott Press by William Morris. An offshoot of the Arts and Crafts movement, which advocated fine craftsmanship and high quality materials over mechanized mass production, the private presses produced books using traditional printing and binding methods, with an emphasis on the book as a work of art as well a source of information. 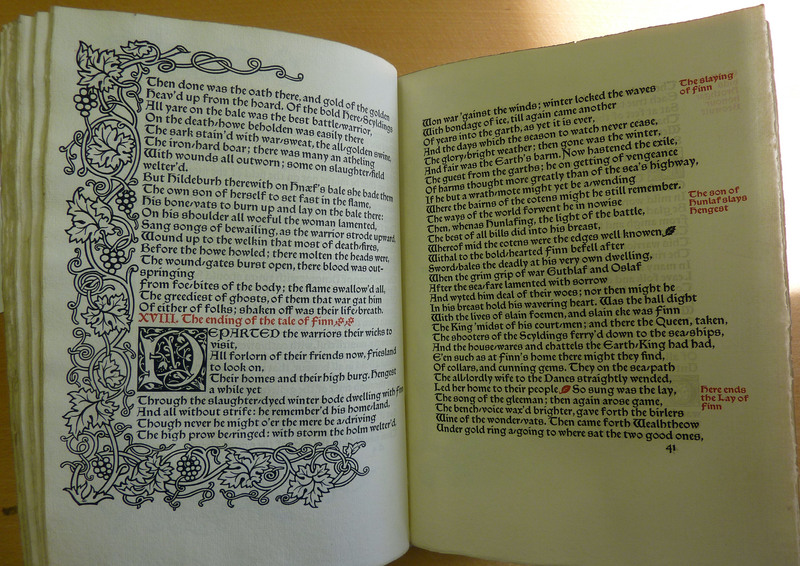 Morris himself was greatly inspired by medieval illuminated manuscripts and the Kelmscott style of fine presswork was to have considerable influence on the work of later presses such as Ashendene and Doves. This entry was posted in Ken Gibb and tagged Cardiff Rare Books Collection, illustrations, Kelmscott Press, private presses, rare books, William Morris, woodcuts. Bookmark the permalink. This looks like a fantastic collection of books, what agreat job to get to catalogue them! 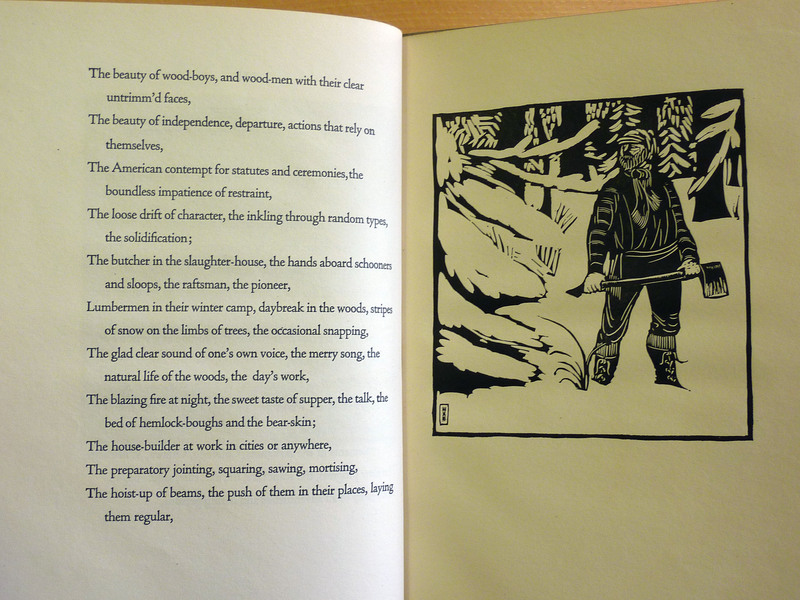 The woodcut with the Walt Whitman poem is gorgeous. © Special Collections and Archives, Cardiff University Library. All rights reserved.